These items are new and have never been worn by or tried on by any other animals. 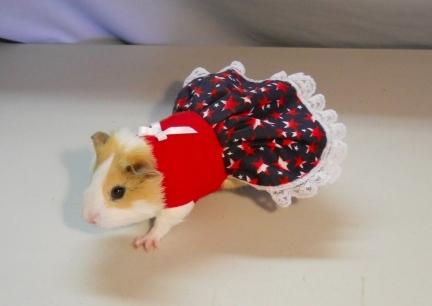 This photo is of Damsel, our sweet Cavy in her own dress. These little dresses are made in a variety of ways. 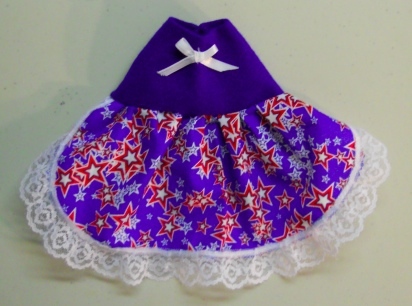 This one is a Cute Star Print Dress with Lace and a Little White Bow! I wish the photos showed the outfits better then they do. The waist measurement on the Dress is approx 11 1/2", but has a large piece of vecro to adjust down, the fabric also does have a bit of stretch in it, and the outfit is approx 7 1/2" from neck to tail.